Than Sadet literally means ‘royal river’. The area was given this name in honour of King Rama V who visited the area several times during his reign. It is customary to also call the beach Than Sadet although perhaps more accurately it should be called ‘Haad Than Sadet’. Despite its beautiful beach and royal connections, Than Sadet has resisted becoming a major tourist attraction on the island. This is because of the difficulty of reaching the beach, and because it is a small beach owned by local families who have kept to the simple formula of catering to backpackers with basic Thai style bungalows. Things are slowly changing. 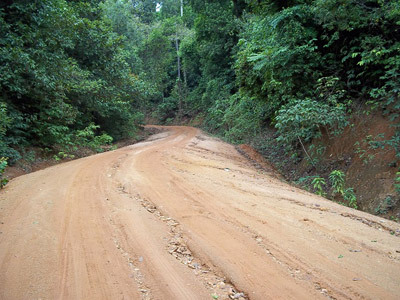 The road from Ban Tai to Thong Nai Pan has been paved and now work is starting on improving the road to Than Sadet. At present the island’s electricity supply doesn’t reach the beach resorts at Haad Than Sadet. Instead, electricity comes from generators that are switched off in the evening. No doubt over the next few years this will change. Than Sadet is a village, beach and large national park that stretches over a wide area. It is free to enter the park. The park is famous for its waterfall course that was a favourite spot of King Rama V. He signed his name on one of the rocks. Subsequently two other Kings of Thailand, including the present King Rama IX, have added their signatures. The picture shown below was taken in July when the water levels are at their lowest. 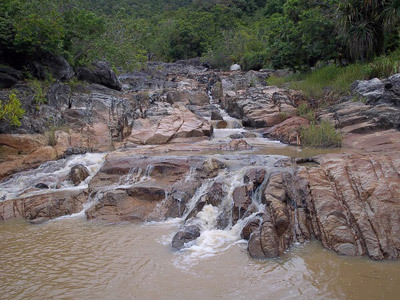 The best time to visit Than Sadet waterfall is between December and February. In this picture you can see all three royal signs. From left to right, the authors are Rama V (in 1901), the current king Rama IX (in 1962) and Rama VII (in 1928). There are a couple of bungalow outfits to stay at on the beach. The most popular is Mai Pen Rai Bungalows. They are located right on the beach front. These beachfront bungalows cost between 1,000 THB and 1,300 THB a night depending on the season. They come with fans and are beautifully built using natural materials. 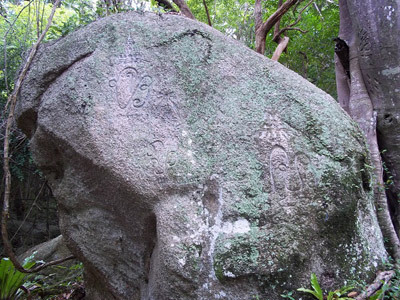 Some are built around the large granite boulders which are a feature of North East Koh Phangan. Bear in mind that all electricity in Than Sadet comes from a generator, which is switched on only between 11am and 4pm and 6pm and midnight. Mai Pen Rai Bungalows also has a beach restaurant. The food is good, particularly the Western dishes with a French co-owner overseeing the kitchen. At the opposite end of the beach to Mai Pen Rai bungalows there is a cluster of small restaurants and bungalow resorts clinging precariously to the steep headland. The climb to the top of the headland is by concrete steps pinned into the granite rock face. It’s not far, but it is steep. It is worth making the effort as the view from the headland is magnificent. 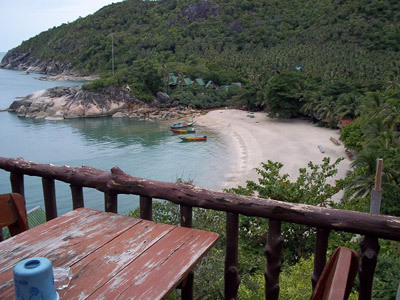 The picture is taken from the restaurant at Silver Cliff Bungalows, where small bungalows with an equally good view are available for 400 to 500 THB a night. You can't book these bungalows online, only by telephone a few days in advance. This said they are rarely full, and there are plenty of other places to choose from, so if you want to stay perhaps it’s less hassle to sort it out when you get there. Bon chance!